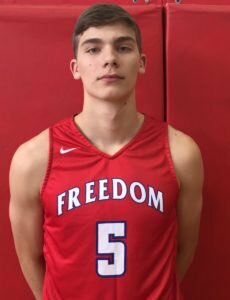 FREEDOM 76—Fletcher Abee 33, Jakari Dula 14, James Freeman 12, Birchfield 5, Logan 3, Moore 2, Rice 1, Davis 4, Johnson 2. WATAUGA 53 (incomplete)—Blaine St Clair 13, West 4, Freeman 2, Sears 3, Castle 2, Bond 7, Green 4, Ricker 7, Robbins 6, Martin 4, Rothrock. Notes: Abee becomes Freedom’s all-time leading boys’ scorer with 1,705 points, passing 2004 gradute Chris Moore (1,704) …. The Patriots’ win streak is at 12 games … Watauga has lost two straight games and has a .500 record for the seventh time this season … Freedom beat Watauga 80-40 in Morganton on Jan. 18 … The Patriots are 45-5 in their last 50 games and 73-8 in their last 81 … Freedom has won at least 22 games for the third straight season and 20 more more in four straight and for the eighth time in nine seasons… The Patriots are Northwestern 3A-4A champs and have the league’s No. 1 3A playoff bid… Freedom has won five league titles in head coach Casey Rogers’ 13th season as head coach… Watauga head coach Rob Sanders is two shy of 200 for his career. Records: Freedom 22-1, 13-0 Northwestern 3A-4A; Watauga 10-11, 6-7. Reported by: Rob Scott, Freedom coaching staff. HICKORY 61—Davis Amos 15, Hamourii Joyner 10, Clark 9, Young 3, Jaylin Harper 12, Abernathy 6, Del Valle 5, Huit 1, Nichols, Ahlers, Culbreath, Long. ALEXANDER CENTRAL 43—Jem Lowrance 20, Strickland 8, Wooten 2, Benfield 3, Walker 1, Kerley 9, Stikeleather, Presnell, Chapman, Elder, Hager. Records: Hickory 18-4, 11-2 Northwestern 3A-4A; Alexander Central 15-8, 8-5. WEST LINCOLN 27—Propst 9, Brown 2, Lail 9, Willis, Duncan 1, Marly 2, Hopper 2, Short 1, B. Beam, N. Beam 1. EAST LINCOLN 78—Sidney Dollar 15, Adams 9, Bean 3, Kuthan 9, Allden Horne 14, Zirkle 3, Staples 5, Petey Nichols 12, Jones 8. Notes: Nichols’ 12 points are a career high for East Lincoln … The Mustangs share first place with Maiden and close the regular season Friday at third-place Newton-Conover… The Rebels have lost 43 straight games … West Lincoln has scored 30 or fewer points in eight games this season … East Lincoln is 46-8 under head coach Jon Hancock (second season) … The Mustangs have won conference titles in three of the previous four seasons and six times in the previous 11 years … East Lincoln is 162-30 since 2012-2013 … The Mustangs beat the Rebels 70-23 at West Lincoln on Jan. 18. Records: W. Lincoln 0-22, 0-13 South Fork 2A; E. Lincoln 21-1, 12-1. NEWTON-CONOVER 43—Covington 7, Danner 2, Trey Kennedy 11, Guerry 9, Matthew Martinez 10, McCathern 4. MAIDEN 51—Ly 4, Caleb McDaniel 11, High 7, Boyles 2, Montrell Stinson 16, Diciuccio, Farley, Wicker 6, Howell 5 Harris, Abernethy, Morris, Copeland Gabriel, McClough. 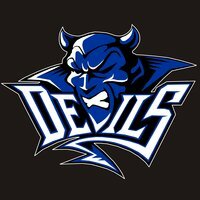 Notes: Maiden has won eight straight games and is 10-0 at home this season … Newton-Conover had a six-game win streak snapped … The Blue Devils share first place with East Lincoln with one league game to go… Maiden beat Newton-Conover 51-45 in Newton on Jan. 18 … The Red Devils will finish at least third, their best in conference since a third in the Southern District 7 Athletic 2A four years ago … Maiden last won or shared a conference title in 2004-05 … A win on Friday would give the Blue Devils a chance to match their most wins since 1977-78 (23, three times) with a win in the first round of next week’s league tournament … Newton-Conover went 6-20 last year, their fourth under head coach Matt Wilkinson. Records: Newton-Conover 14-9, 8-5 South Fork 2A; Maiden 21-2, 12-1. Reported by: Justin Brittain, Maiden coaching staff.